In my search for a set of Bluetooth earbuds, I didn't expect Bose would come out on top. Having tried Jaybird's X3s and Freedoms, as well as the JLab Epic2s, Bose's offering seemed overpriced, unattractive, and offered inferior longevity compared to most competitors. But after over a week of using the Soundsport Wireless, they've easily become my go-to earbuds, despite their middling battery life and high price tag. Excellent comfort, compelling audio, and a great app experience make up for the aforementioned shortcomings, and then some. Bose nailed it here. 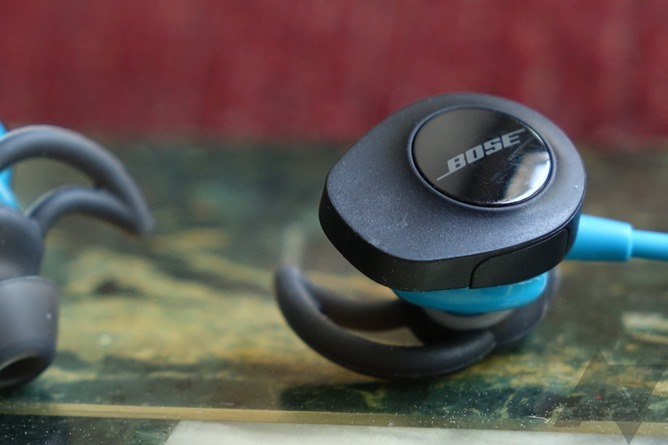 Sound True to the Bose name, these earbuds take audio seriously. They are a little bass-heavy (surprising for a non-sealing design), but these are the best-sounding Bluetooth earbuds I've tested by a long shot. Comfort Easily the most comfortable Bluetooth buds I've used. The non-sealing design puts no pressure on your ear canal, and I found the "wings" barely put pressure on my ears at all. They're super light, too. Companion app The Bose Connect companion app is shockingly well-done - and useful. 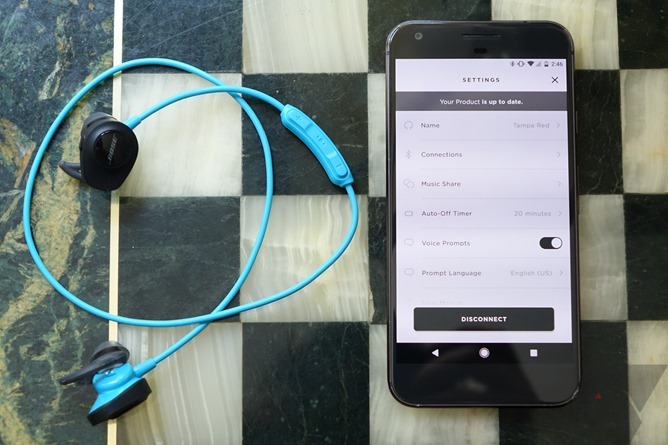 It allows you to update the earbuds' firmware, control volume, see the battery level, manage paired devices, set an auto-off timer, and even share your music to other Bose headphones. Battery life Bose rates the Soundsport Wireless for 6 hours of playback time, but I found it was closer to 4 or 5 at my typical volume levels - very "meh." Price These cost $149. And they don't go on sale often. Proprietary tips The ear tip design for the Soundsport is unique to Bose headphones, meaning if you lose your tips or tear one, you'll probably want to buy replacements from Bose - they're $10 for two pairs. Yikes. 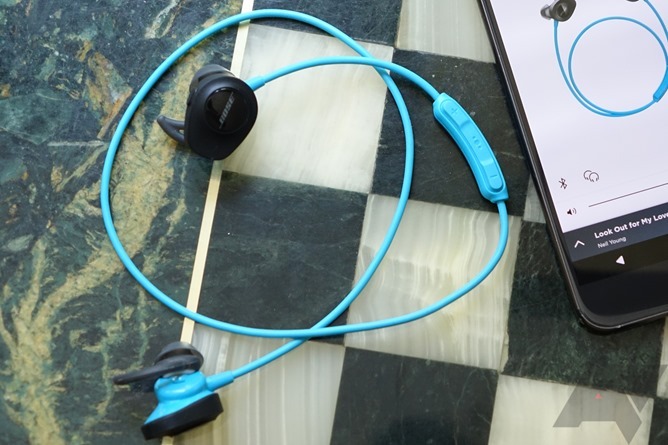 The Soundsport Wireless probably don't look like headphones you'd call light and comfortable. The bulky driver housings are hardly attractive, especially in this "aqua" color, and you'd be forgiven for thinking they sit on your ears like a pair of boat anchors. The thing is, they don't. The Soundsport are incredibly comfortable, even more comfortable than the Jaybird X3s I've also been testing. They put virtually zero pressure on your ear canal (because they're non-sealing) and the "wings" that hold them in place are barely noticeable to me. If you're not familiar with what I mean by non-sealing, the Bose Soundsport do not create a seal with your ear canal. As such, you'll be able to hear lots of ambient noise when wearing them. This is an advantage if you plan to walk (or run, or bike) with them outside, but many people don't like non-sealing earbuds for the gym for this exact reason. The other disadvantage to a non-sealing design, typically, is inferior bass response. Thankfully, that's not at all an issue with the Soundsport, but you won't find the level of isolation provided by Jaybirds and their Comply-style foam tips here, if that's something you need in an earbud. So, yes, the Soundsport look big and clunky, but once they're on your ears, you'll hardly notice them. The cable does pull a bit at times, and I do have to adjust it occasionally when working out, but it was hardly what I'd call a deal breaker. I've seen some reviews suggest the cable situation is intolerable, but I didn't find that to be the case, and it was easily worth putting up with given the headphones are otherwise extraordinarily comfortable. The one design nag I do have is the inline controls. The buttons require far too much pressure to actuate and feel incredibly squishy. I rarely use them, though, so I can't say this really had a material impact on my experience. My favorite thing about the Soundsport is the sound. They really do sound great, and not just "for Bluetooth earbuds." These are definitely among my favorite in-ear headphones I've tried that don't have a price reaching hundreds of dollars higher. Sure, there are audiophile-approved in-ear monitors out there that probably cost as much or even substantially less than the Soundsport while sounding noticeably better, but they aren't wireless and thus really don't make for a good point of comparison. The character of the audio on the Soundsport is pretty punchy - Bose doesn't allow you to EQ the headphones or offer any audio mode presets, curiously, but they do say that the Sounsport will use "Active EQ" to optimally adjust the audio for whatever's playing. The Soundsport offer a surprising amount of bass (likely owed to those bulky driver housings), very clear mid-range, and reasonably good highs. Detail is well-preserved and I found that while not always very faithful to the character of some recordings, the Soundsport never sounded unpleasant. I enjoy listening to music with these headphones, something I really couldn't say of the Jaybird X3s or, especially, the JLab Epic2s. They also get plenty loud, if you're concerned with that. It's not great. Bose rates the Soundsport Wireless for 6 hours of playback, but I found 4 or 5 hours was generally what I managed, depending on how high I cranked the volume. That's not great, but I think the silver lining here is their low weight and resultant comfort. Still, it's a definite mark against them compared to the competition, with JLab's popular Epic2s offering an estimated 12 hours - double the play time. Charging is accomplished via microUSB, which is a definite win versus the proprietary cradles Jaybird is using these days. If you do want a cradle, Bose sells one with a built-in battery for charging on the go... for $50. The Soundsport were very easy to pair (the companion app will do it for you automatically), and you can even pair them via NFC if you're so inclined. Just tap your phone against the inline control module after powering them on and you'll be set to go. 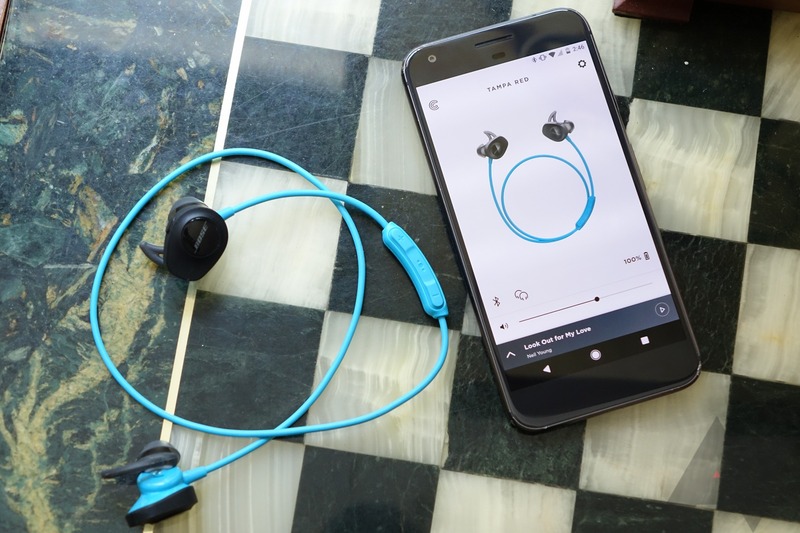 Bluetooth performance was excellent even with the notoriously finicky Pixel XL, and the Soundsport reconnected to the phone eerily quickly every time I powered them on. I had no cutouts or disconnections at all. The Bose Connect app really seals the deal for me with these headphones - it's definitely worth downloading. Here's a summary of what you can do in the app. The app itself is very clean and well-designed, and performs exceptionally well on my Pixel. This is the extra mile I kind of expect (rather, hope) a company like Bose to go to ensure that when you're paying a premium price for the product, you get a premium experience. The app does far more than the Jaybird MySound app (even if there's no EQ stuff to play with), and legitimately adds utility. I'd like to see an option to set the level for the low battery alert (it's at 10%) and audio profiles, but really, this is pretty complete. Well done, Bose. Of the four sets of Bluetooth earbuds I've tested so far, the Bose Soundsport Wireless are easily my favorites. While the lackluster battery life, questionable aesthetics, and high price work against them, the amazing comfort, excellent audio, and great companion app tip the scale in their favor convincingly in my eyes (or rather, in my ears). No doubt, they're not for everyone - the non-sealing design and absolutely-required "wings" will make them nonstarters for some. But even as someone who was skeptical of the non-sealed fit, I'm a convert. These headphones sound wonderful, and I can wear them much longer because I don't have something pressing up against my ear canal. The Jaybird X3s, by comparison, give me real fatigue over time, even if they are generally what I'd call comfortable. I realize I'm not going to convince everyone a $150 pair of wireless earbuds are worth it. And maybe you should wait for a sale - the Soundsport Wireless have been out for nearly a year now, and I have to wonder if Bose is working on a revised version yet. But even if you do pay full sticker price, I think you're unlikely to regret it. 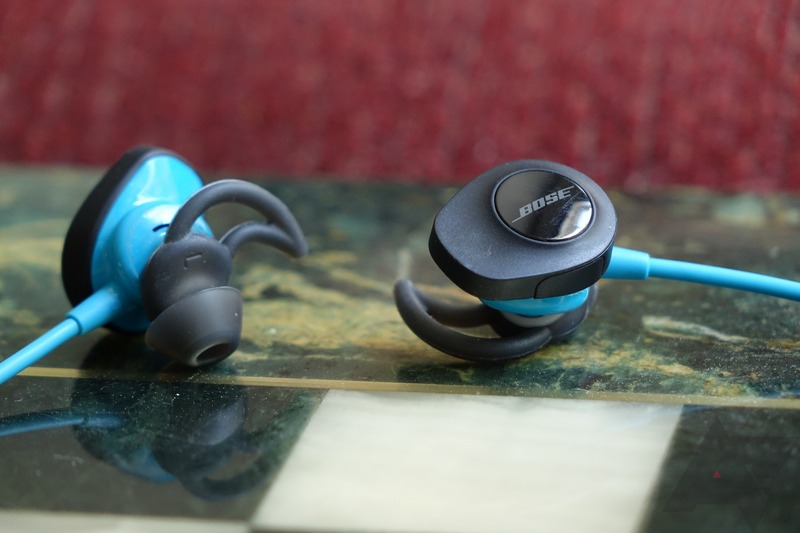 I can't see myself easily swayed from the Soundsport after using them for the last week-plus, and I'll be very curious to see if Bose issues a new iteration later this year.